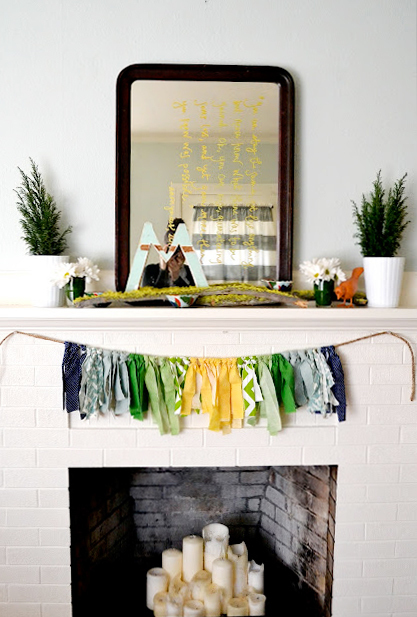 In my post Monday, about my updated-for-spring mantle, I showed you guys my new fireplace garland. Today, I'll show you how to make it :). For the last couple years, this is what the garland on our fireplace looked like. Does anyone else out there get completely lazy when it comes to changing up decor accessories? The flower garland is adorable (and you can learn how to make one of your own here), but it was time for something new. 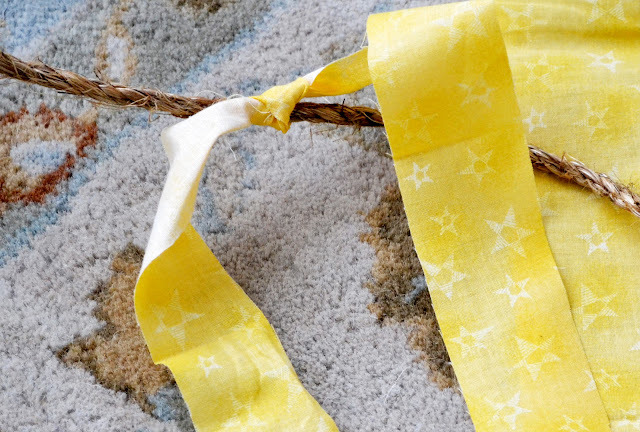 And new came in the form of a bright, colorful, ombre-esqu fabric garland. 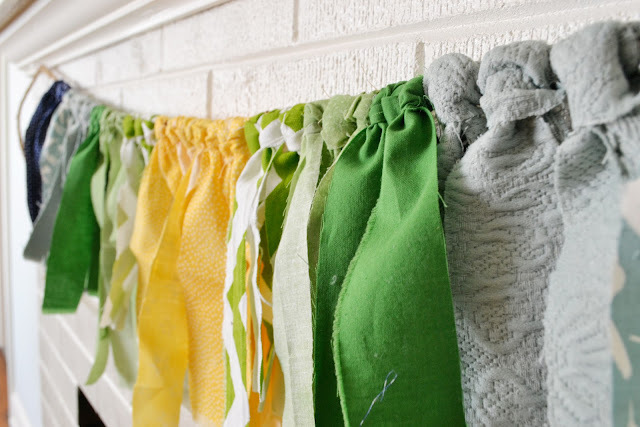 You want all your fabric to lie nice and flat, because then the garland will hang nicer. 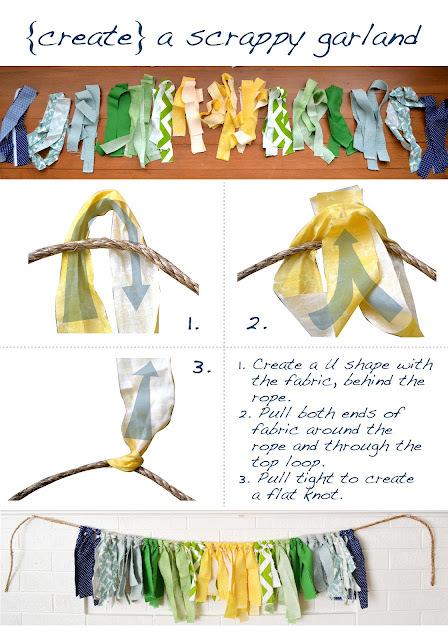 Below is a tying method that works great. A few notes: I used fabric that I had on hand (see note above about lazy ;). I cut the scraps into approximately 1" wide by 24" long strips, but you can tell by the photo above that I wasn't terribly precise. I cut six strips of each fabric, so there would be three strips of fabric on each side of the garland. 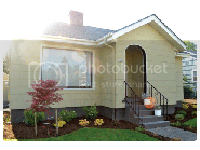 As you can see above, I laid it out before hand to make sure I like the look before proceeding. So friends, tell me. How to you inject a little bit of celebration into everyday life? *Update: I'm linking up to the Spring Craft Link Party at Centsational Girl. You are so right about that Jenn - every day is a celebration, every minute, every second should be a celebration of this miracle of life. And now your adorable fabric garland...I have to try this somewhere or for someone. I'm thinking even over a crib or changing table for a nursery - adorable! p.s. i celebrate little moments in life through food, haha! So cute! Love the ombre-ish look! 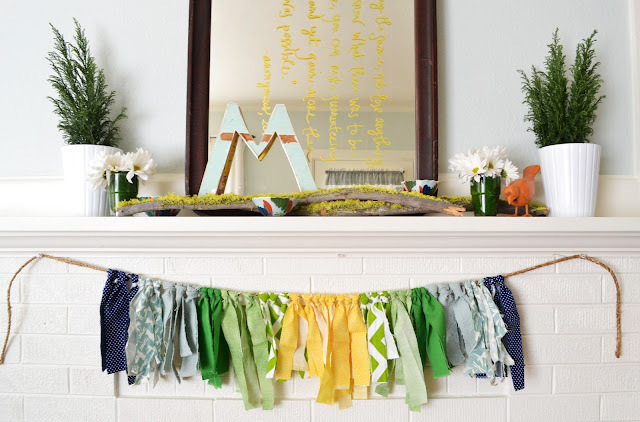 I love garlands hanging on the mantel and this is too cute! I'm glad you shared pointers on how to tie it as well. This is really cute! What is the writing on the mirror? Jenn I absolutely LOVE this! 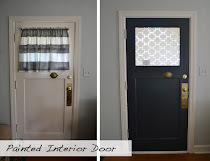 I think I will give it a go and if it turns out I may put it on the blog...will give you all the inspiration credit!!!! lovely.